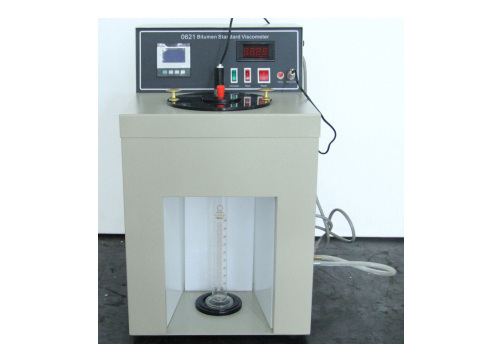 As per T0621 Asphalt Standard Viscosity Test in the Industry Standard of People’s Republic of China JTG E20-2011 Standard Test Methods for Bitumen and Bituminous Mixtures for Highway Engineering. Use Range: determine the viscosity of liquid petroleum asphalt, coal pitch and emulsified asphalt at flowing state. 3. Sample tube: four pieces in a set. The diameter of effuse tube is: Ф10 mm±0.025 mm, Ф5 mm±0.025 mm, Ф4 mm±0.025 mm and Ф3 mm±0.025 mm. A: Diameter of ball: 12.7 mm±0.05 mm; Sign height: 92 mm±0.25 mm. B: Diameter of ball: 6.35 mm±0.05 mm; Sign height: 90.3 mm±0.25 mm. 5. Temperature controlling range: room temperature～90 ℃. 8. Heating type: electric heater. Use a circulation pump circulating water bath liquid to control the temperature in the circular trough. Heating power is 600 W.